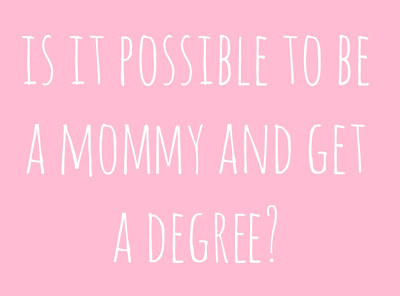 Is It Possible to be A Mommy and Get A Degree? These days, getting a degree is even more convenient than ever. With the rise of popular online Universities and better technology that practically delivers the classroom right to your living room, going to college with a child is much easier to do today then it was 20-30 years ago. When I first found out Jasmine was on her way, shocked and petrified doesn't quite describe my reaction to the news. All future hopes of my education were dashed. It was if suddenly someone put my degree on a string, tied it to a car, and took off with me chasing after it. And no matter how close I got, they would just speed up faster; until my dreams were a tiny dot in the horizon. No matter how positive I appeared, I honestly never thought I would make it this far. For every class I got an A in, for every obstacle James and I overcame, three more issues would suddenly sprout up. We had to meticulously plan our schedules so that our classes didn't overlap and someone would always be with Jasmine, because we sure couldn't afford daycare. Heck, most of the time we could barely afford our books. Still it's getting done. And for James, it is done. I'm so proud to say that last month, Jasmine and I (along with 10,000 other people) watched as he walked across that stage and got his degree. To many, he was just another student being handed a piece of paper, but for us, that piece of paper has a mighty long story attached to it. So when it comes to having a small child and going to school, is it possible? Yes, yes and a resounding yes! Make no mistake, it will be difficult. You will get stressed. You will cry and want to stop, but you CAN do it. Believe in yourself. I already believe in you. While I will never turn my nose up at online colleges (in fact one of my best friends got her degree online) I fully encourage those who can actually physically attend college to do so. Why? I've done both. The majority of my Associates Degree was done online, whereas the all of my classes for my Bachelor's Degree were taken in class. The difference between the amount of information I learned and retained is incredible. Going to school online takes away most of the stress of exams. It's a bit easier and more relaxed and even though professors have methods of ensuring that you actually prepare for your exam (i.e. imposing time limits) there's no sure way to make sure the students aren't leisurely flipping though their textbook and looking up the answers while taking the exam. Whearas physically being in college forces you to study, study, study, because once you walk into that class and that professor passes out the exam, you can't google your way into an A. You have to rely solely on your ability to study the information in a way that you can easily recall. So while getting your degree online may seem like the simple solution, going to school for 4+ years won't do you a bit of good if you can't remember a darn thing you studied. Going to school online does afford a bit more convenience than physically attending, but like I said, if you have the opportunity to go, do it! Good luck to you in your journey. If you have any questions, advice or experiences that you'd like to share, feel free to comment in the comment section below. My Mom became pregnant with me after her first year of college, and to this day her Dad tells her: "I'm still waiting for that degree!" It's a hard thing to do when you have kids! Currently she's the boss of a bunch of people with Master's and PhDs...I doubt most of them know that her highest education is a year of engineering school. My Dad did finish college and went on to get his Master's degree--but I pretty much don't remember him being around for the first 6 or 7 years of my life, because of working full time and school. We're hoping Angel will finish school before we have kids, but if not, oh well! All things are possible! You guys are a great example of how to keep working hard and pursuing education while being good parents at the same time. Your parents rock! I'm sure it was difficult for your dad to be away from you, but it sounds like it paid off in the long run. And finally, you admit you and Angel are having kids! Win ;) I have a few suggestions on the name if I may. Reese for a boy and Theresa for a girl. See how well that works? lol JK. On a more serious note thanks for the compliment. It's not easy going to college with a kiddo, but it is very possible! Trust me, I KNOW it can be done and every chance I get, I encourage mommies to get it done. I'm currently working on my Master's degree and while I always wanted more than one degree, it took me six years to get the first one. At the time, it seemed like it would take forever, and six years is a long time in undergrad. But I had to realize that I wasn't the typical student. I was a mom--a single mom with two children and working.. ALL full time. More importantly, I had to realize that I had to stop comparing myself to others. College is not a race, but it's a marathon. It is been so HARD, but it's so worth it!